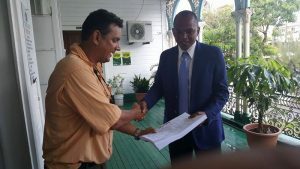 A Partnership for National Unity (APNU)-aligned Georgetown City Councillor, Alfred Mentore said Town Clerk, Royston King’s legal opinion on the implications of a ministerial order for City Hall to suspend the parking meter bylaws was not approved by Council. “We didn’t order that opinion. The Council didn’t order that opinion. That is an opinion ordered by the Town Clerk and we were here to today to discuss the substantive item on this extraordinary meeting’s agenda,” he said. Mentore, who Monday voted against a motion for time to be granted for the council to consider legal advice before deciding whether to accept Minister of Communities, Ronald Bulkan’s order declined to be drawn into speculation about King’s decision. He, however, argued that the Town Clerk should have instead communicated with the Minister on the instruction of the acting Mayor, Sherod Duncan or the substantive Mayor, Patricia Chase-Green, not on his own. “The Town Clerk functions as an administrative officer of Council and he functions as a creature of Council. 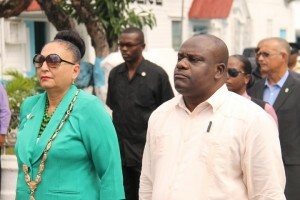 The decision to directly speak to the minister, for me, is wrong is wrong, it’s out-of-line, it is overstepping his jurisdiction as an officer of council and to speak or to write the minister directly is totally out of line,” Mentore told Demerara Waves Online News. Except for 17 of the 20 APNU-aligned councillors, those from the other parties and organisations came prepared to approve Bulkan’s order dated March 17, 2017 and so pave the way for Smart City Solutions (SCS), the 80-percent shareholder, to be informed of the suspension. Under intense public pressure, central government has asked for the contract to be suspended and renegotiated with inputs from various stakeholders. Rather, acting Mayor Sherod Duncan and at least 10 other councillors were surprised by the circulation of the legal opinion of Attorney-at-Law, Roger Yearwood. Mentore said the APNU+Alliance For Change coalition missed an opportunity to redeem its image but City Hall ended up disrespecting the Minister of Communities. 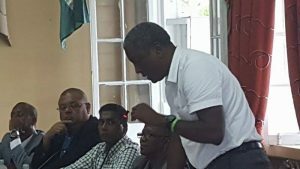 During the debate on a motion sponsored by APNU Councillor, Heston Bostwick, the Town Clerk told the Council that as the signatory to the contract he sought legal advice. “Having regards to my own obligations under the law and being the one who signed on on the contract, having received the approval and the authority of the Council, I sought legal advice on this matter because it will be foolhardy for me to go ahead to brief Council without saying to Council what are the legal implications,” said King. The Town Clerk recalled that when he first learned of plans to suspend the parking meter contract for three months to make way for renegotiation, he contacted Bulkan and expressed the concerns. King said he acceded to the Minister’s request to document his concerns about suspending the contract. City businessman, Paul Fraser presenting a petition on behalf of the Movement Against Parking Meters to acting Mayor, Sherod Duncan. The Town Clerk said he later received Bulkan’s order suspending the parking meter bylaws following which he suggested to him that the matter would have to be taken to the Council. “I suggested to the Minister that since I, as Town Clerk, do not have the power to suspend the contract, to suspend the bylaws or any Councillors… that the only method under the law, under the act is to bring it to the attention of the Council for discussion, deliberation and a decision,” said King. The Town Clerk recalled suggesting to the acting Mayor that an extraordinary meeting be held because it is only the Council could suspend or disapprove it, having considered it before. 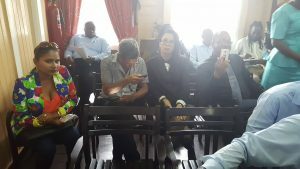 Meanwhile, member of the Movement Against Parking Meters (MAPM), Attorney-at-Law, Pauline Chase said Monday afternoon’s delay in considering the ministerial order until Councillors study the legal advice “was a national embarrassment.” “There is no legal basis for what went on there. It’s just all delaying tactics and hoodwinking,” she said. MAPM members in City Council’s Chamber listening the proceedings on the controversial parking meter project. MAPM representative, Paul Fraser later presented a notarised petition of more than 6,500 signatories calling for the parking meter contract between City Hall and Smart City Solutions to revoked. “I think we have integrity, I think we have the rule of law on our side, I think it is abundantly clear that this contract has been entered into illegally so I think sense will prevail, the law will prevail and these people will be sent packing back to Mexico,” he told Demerara Waves Online News.